It is non- - symbiotic Nitrogen fixing bacterium recommended for non-leguminous crops like Paddy, Millets, Cotton, Tomato, Cabbage and other monocotyledonous crops. Nitrogen fixing bacteria convert atmospheric nitrogen in to Ammonia. In nitrification process Ammonia is converted in to nitrate, which is then made available to plants through roots. Azotobacter also produces growth-promoting substances like IAA, Gibberellic acid. Cytokinin, Vitamins, etc. However, Azotobacter has been found to perform well only if the soil organic matter content is high. AZECO is a high quality Nitrogen Fixing Biological Nutrient Enhancer that fixes atmospheric Nitrogen in the soil non-symbiotically, that is, without the help of a host plant. Depending on soil conditions,AZECO can fix upto 30 to 40 kg of Nitrogen per hectare. AZECO does not harm the soil. Azotobacter actually enriches the soil by making it rich in Nitrogen. For best result with Azotobacter, the soil must have a proper balance of phosphorus, which is beneficial to the bacteria. Farmyard manure in the soil is also helpful. 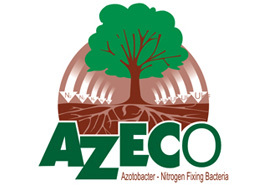 AZECO's slow release mechanism of fixed Nitrogen is highly beneficial for the Root System and Plant as a whole. With Compost/ FYM (All Crops): Mix 3 kg of AZECO with 10 Litres of water and make a slurry. Sprinkle over a cartload of of compost and allow to stand overnight, and apply over one acre of land, prior to sowing and irrigate immediately. With Fertilisers: As per the requirement of the crop, mix AZECO with granular fertilisers like Urea/ DAP and broadcast near the root zone. Seed Treatment: Mix 500 gm AZECO with water and mix with seeds to be sown on one acre of land. Shade dry and sow as usual. For Transplanted Crops: Mix the 2 Kg of AZECO in 10 Litres of water in a bucket. Dip the root zone of seedling for a few minutes before transplanting. 1500 gm in the seed bed per acre,1800 gm during transplantation per acre. 1500 to 1800 gm per acre. 300 gm in seed bed per acre 450 gm during or after transplantation of seedling as dipping per acre. 600 gm during planting of sets or root stocks in an acre. 900 gm per acre after each cutting. Flowers (not for short duration season flowers) 900 gm during the planting per acre. Fruits such as Mango, Grapes, Citrus, Banana, Litchi, Figs, Pomegranate, etc. 600 gm during the plantation per acre. 1800 gm depending on the number of the plant per acre after 6 months of plantation. AZECO is a living bacteria, do not apply/ mix chemical bactericide/ fungicide before or after applying AZECO. AZECO should be stored in a cool, dry, shaded place away from direct sunlight. Besides Nitrogen fixation AZECO synthesises growth promoting substances that stimulate and nourish plants. More specific benefits of Azotobacter include. Shortening of germination period and promotion of vigorous growth. Better root formation for more efficient utilization of soil nutrients. Build up resistance to disease and pests. Increased yield of grain and fodder by 15-30%. Reduces dependence on chemical Nitrogen input by 20 to 25% per acre. Acts as biological conditioner of soil.